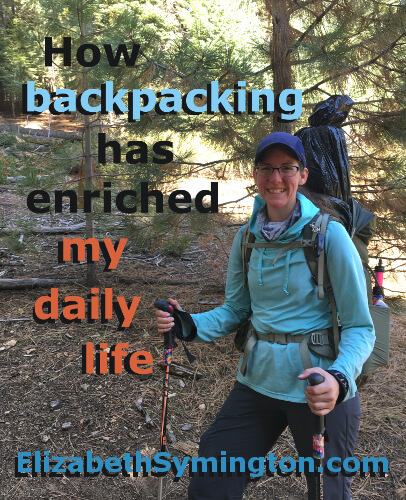 This is Day 29 of the 31 day series on “How backpacking has enriched my daily life.” I expected lightweight backpacking to be a hobby. Instead it has transformed me for the better. It’s fun meeting fellow backpackers and being able to instantly relate to one another through our wilderness adventures. I now understand that Snickers makes a delicious breakfast! I finally understand the immense joy of getting to take a hot shower after a long hike. And I’ve heard the woods call me and I just had to go and see what was out there. I also understand why anyone would be obsessive enough to cut their toothbrush handle in half. I am that woman. I hike with a half of a bamboo toothbrush, because if I can cut every item in half, then my pack would be 50% lighter. A lighter pack makes for a much happier and less tired Elizabeth. A lighter pack means I notice more of the beautiful nature around me. 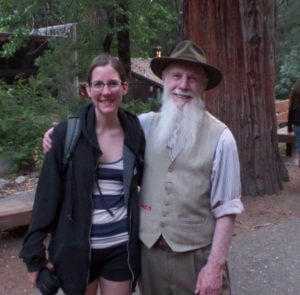 If I could go back in time and talk to just one person, it would be John Muir. I am very grateful for his legacy of the idea of the National Park System and for protecting my beloved Yosemite. I’d would love to try to keep up with Mr. Muir as he sauntered through the woods. Now that I’ve spent more time in the woods, I feel like I understand Mr. Muir’s urge to climb a tree during a rain storm so to be apart of the experience and to feel the power of the storm. Backpacking has introduced me to my backpacking family. They’re like my motorcycle family, except that they talk about food a lot more.